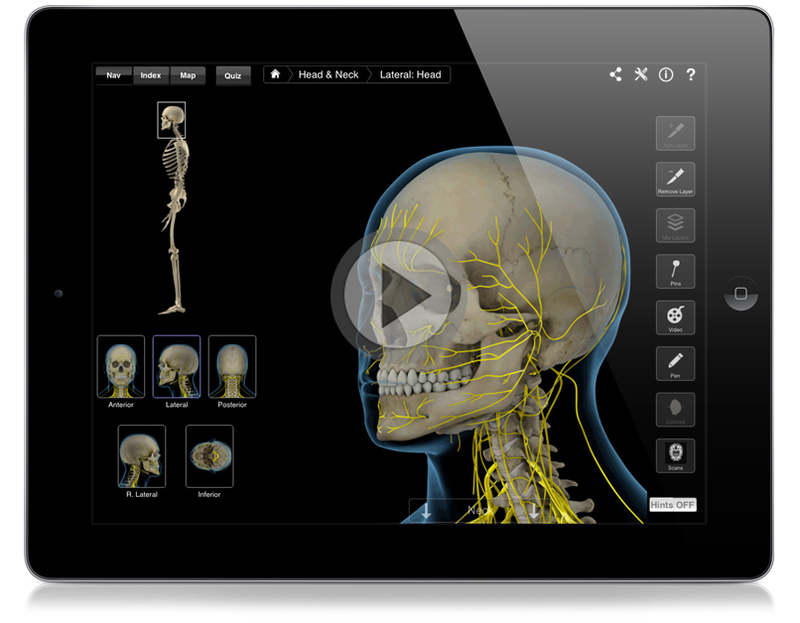 Brain & Nervous System Pro III now features multiple orthogonal slices on the transverse, sagittal and coronal planes. 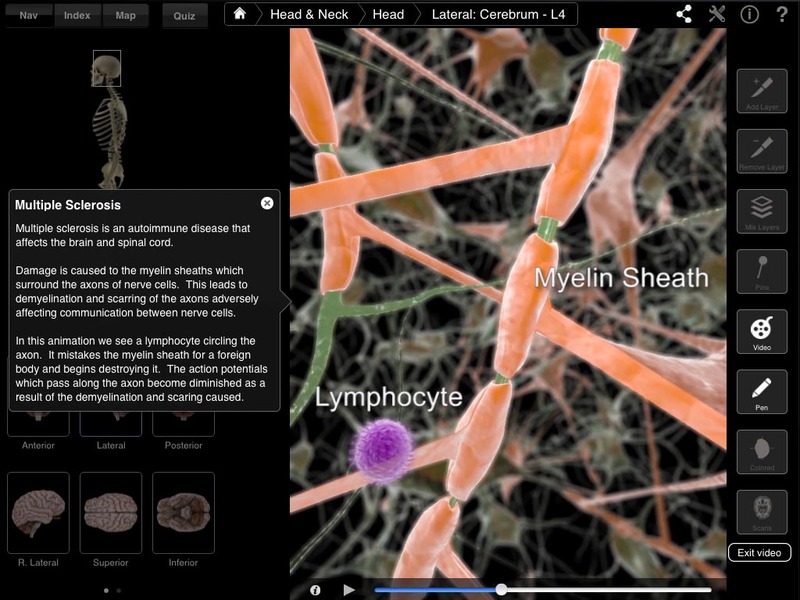 It also features spectacular animations which offer insights into diseased states and functional anatomy down to the cellular level. Additionally, an entirely new and comprehensive peripheral nervous system is now incorporated, while the central nervous system has been expanded. 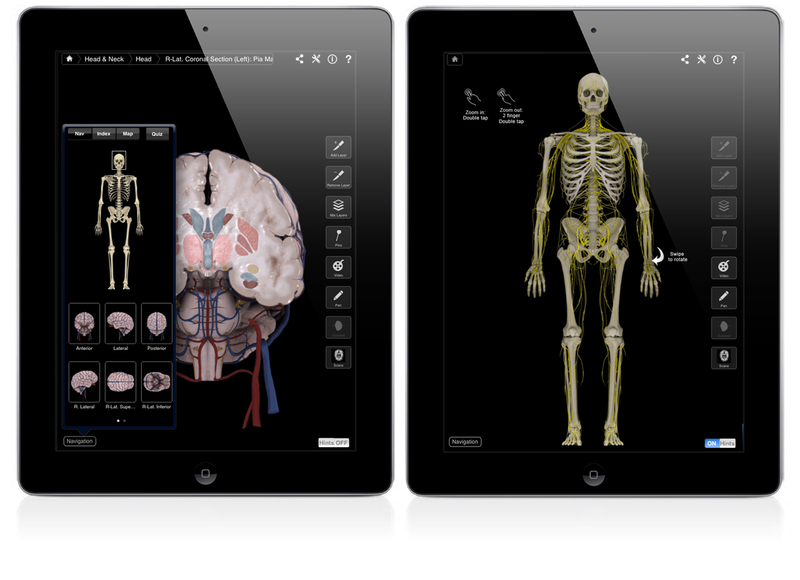 Now with a simple swipe of your finger you can explore neuroanatomy from a basic to advanced level in 3D. 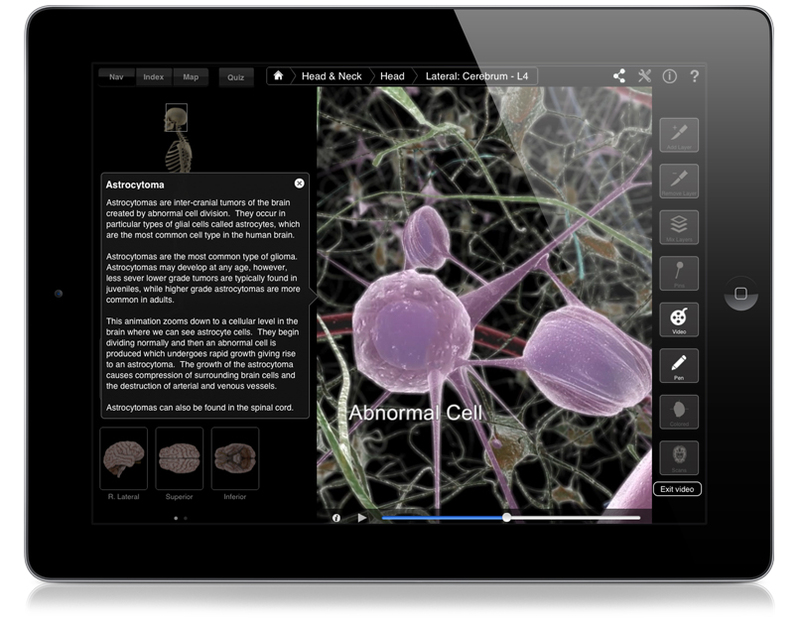 So what’s new in the Brain & Nervous System Pro III? Well lots actually! 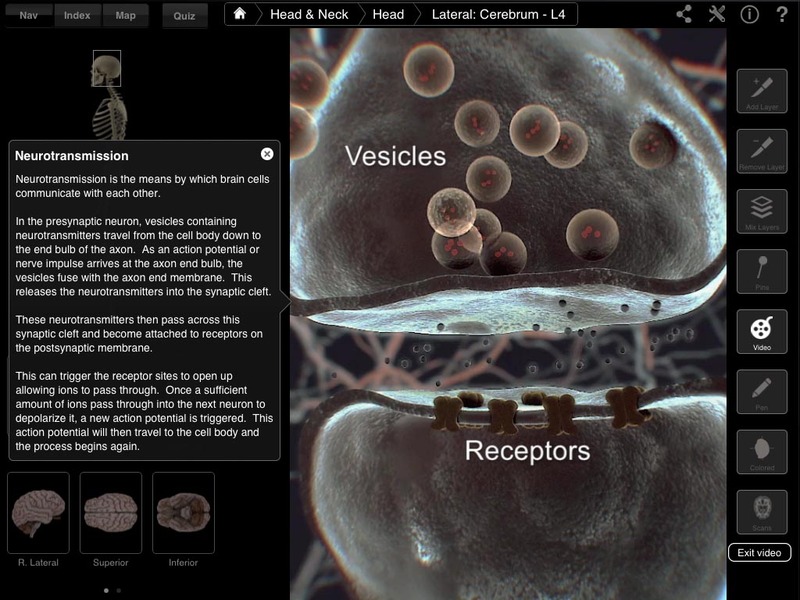 Including a completely new interface, graphical hints, sound, a pen tool, tri-planar multiple ‘slices’ of the brain, isolated media of specific nerves, detailed images of thalamic nuclei, 360º isolated video media of brain structures, 2 types of quiz – drag and drop & multi-choice, 728 pin labels with audio pronunciations, draw on any screen image and share via email, facebook, twitter, 7 free animations and lots more! The brain can be fully rotated with a quick swipe, users can also zoom in and out of the brain. 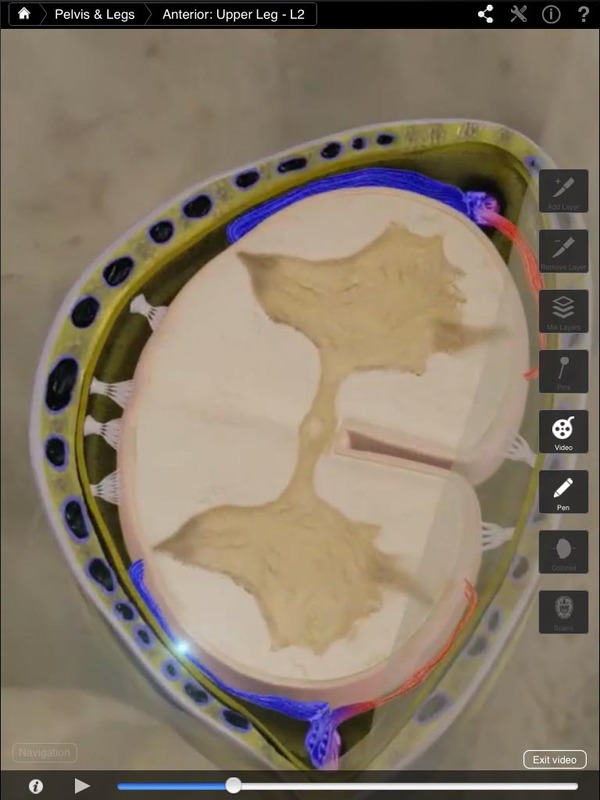 And rather than just the standard anatomical views, you can now observe the location of a brain component from different angles such as inferior and superior views -Transverse, Coronal and Sagittal cross sections. Multiple orthogonal slices on the transverse, sagittal and coronal planes are also available meaning you can ‘slice’ through the brain effortlessly to reveal the inner anatomy of the brain, from top to bottom, left to right and front to back. 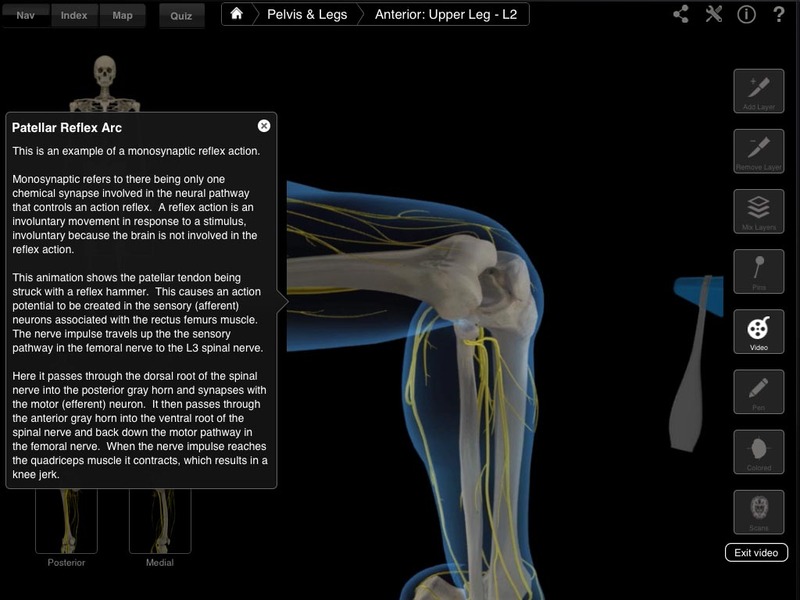 Users can add and remove layers using the scalpel tool. And the ‘mix layers’ button can make one layer semitransparent, which is useful when comparing one layer against another layer. 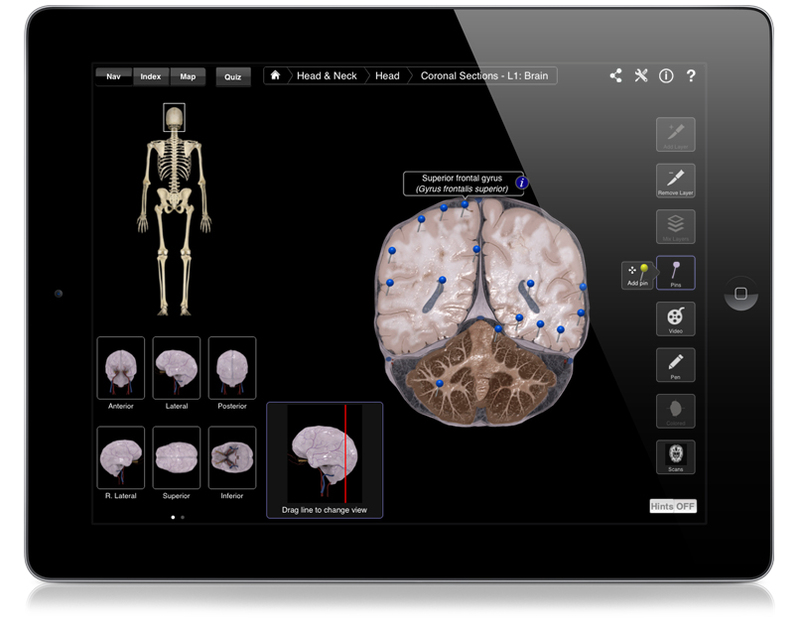 This app also includes alternative layers / maps which detail the ventricular systems and Brodmann areas. By pressing the index button the user is offered an index of the pins available. If a pin name is selected the app will take the user to that pin and label it or a user can simply press the pin button on the floating toolbar and it will show all the pins available on the current screen. On selecting the pin the user can view detailed information and add notes as well as create custom pins! The app can be further customized by using the settings button to turn on and off individual pins. Users can access audio pronunciations for all 728 pin labels . 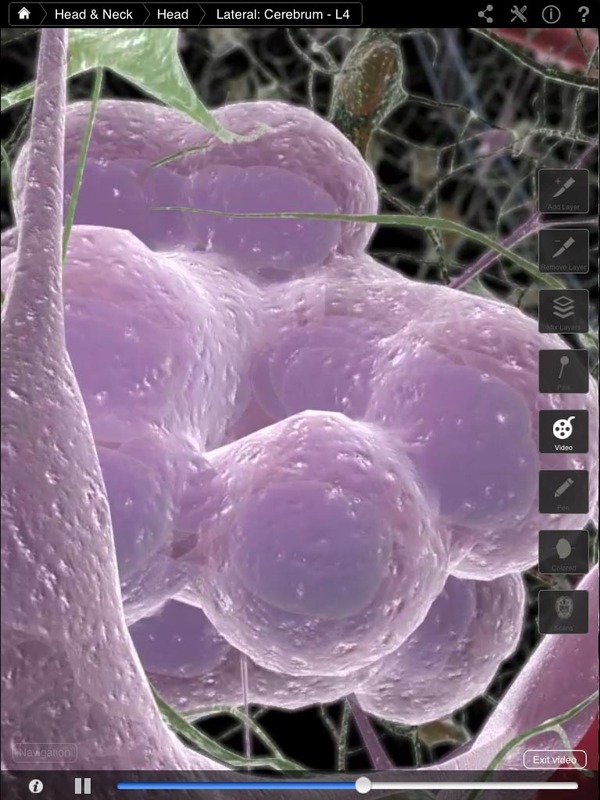 There are also a number of spectacular animations which offer insights into diseased states and functional anatomy down to the cellular level. Also available are 360º isolated video media of brain structures, detailed images of thalamic nuclei and isolated media of specific nerves.